Built with all the iconic character, quality, performance and capability of the T120, the new mean and moody Bonneville T120 Black takes the classic to a new level with real attitude, individuality and style. Featuring an incredible level of detailing and sophistication, from the fully blacked-out high-quality details, including wheel rims, grab rail and engine finish, through to the dark brown seat and beautiful twin-skinned peashooter exhausts, the result is absolutely stunning. 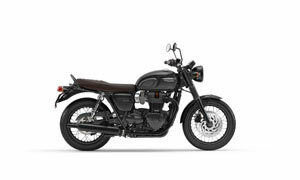 The Bonneville T120 Black is a new motorcycle style icon.^^Please note this price is for Queensland only. Please contact TeamMoto Triumph Blacktown for more information on New South Wales Pricing.^^Offer ends 30/04/19^^*Ride away price includes all offers, cash back, rebates and discounts.